Warnings : No warnings apply, unless you hate crackfic. Bonnie returned from the bar carrying four bottles of fruit juice, two in each hand. Stopping at the table where her friends were sitting, she peered down at the bottles thoughtfully. Janine grinned up at her. “Go on, Bonnie, work it out,” she said encouragingly. “Apple and mango ...” Cath told her. “Right,” said Bonnie. “Okay, so ...” She stared down at her hands again. “Oh, for God’s sake.” Deciding to take action before she died of dehydration, Janine took the two bottles from Bonnie’s left hand and put one down in front of Mary, keeping the other one for herself. Bonnie looked at the two bottles she was still holding, frowned for a second but then finally seemed to work it out and sat down while handing one to Cath. The other girls gave her an affectionate cheer and she beamed happily at them before turning to Cath. “Did you get them?” she asked. “Certainly did,” her friend smiled. Looking round the fairly empty pub to make sure she wasn’t being watched, and keeping her back to the bar, she reached into the large bag on her lap and drew out the object she had pinched earlier that day from the research lab in which she worked. She placed the wooden rack holding four test tubes onto the table. Each of the tubes had a rubber stopper in the top and was about a third full of a clear liquid. Grinning, Cath gave one tube to each of the others. Mary and Janine stared at her, puzzled. “What’s the liquid?” Mary asked, peering into her tube suspiciously. “To the hen night!” said Mary, raising her own tube. “To the pub crawl!” said Cath. “To the hen crawl!” declared Bonnie. The others cracked up laughing, then they all clinked their test tubes together. “So John’s staying at Sherlock’s tonight, is he?” Janine asked loudly after the girls had clinked their newly-filled test tubes together. The other three exchanged a series of covert glances. Bonnie was adorable and they all loved her dearly, but she could be a little slow on the uptake at times. It would probably take half an hour to explain the rules to her and, let’s face it, she would struggle to understand them sober, let alone drunk. If they were going to play games at all, it would be easier to play something like Spin the Bottle, or Truth or Dare – fewer complicated rules for her to take in. “We’ll see,” Mary told her. Bonnie beamed as if she had been given a solid promise. Mary hoped that by the end of the night her friend would be too drunk to remember. Cath grinned at her and topped up Janine’s test tube while Mary poured juice into her own. Her recent nausea was a good enough excuse, but in truth she never allowed herself to get out of control. Too many people around the world were hunting her or wanted her dead, and she didn’t want to be unable to defend herself if any of them should turn up unexpectedly. Bonnie drained her test tube, grinned widely, then delicately wiped her lip. She already seemed to be feeling the booze a little. Janine looked down into her own tube with a disappointed expression, but after a moment she shrugged, tossed down the contents and held out her tube to Cath again. She squinted round the bar, finally spotting Janine chatting up a dishy-looking bloke nearby. Pointing vaguely in her direction so that Bonnie would know where she was, she turned and tottered after Mary, following her towards the toilets. Bonnie peered down at the rack of tubes. Put vodka in just three of them. That should be easy enough ... except she could see only two tubes ... no, there were five tubes ... no ... hang on, why did the number keep changing? Perhaps she ought to have put her contact lenses back in after having a shower after work, because her eyes were doing some very funny things right now. But – put vodka in only three of them. She lifted the bottle and unscrewed the lid. How hard could it be? “Cheers!” Janine and Bonnie replied, clinking their test tubes against hers. Janine was holding her mobile in her other hand, updating her contacts with the phone number of the man from the previous bar. She looked up as Mary returned to the table after another trip to the loo. “Tell me again why you’re getting married in Somerset,” she asked after Mary had sat down. “I know you probably told me before but I’m damned if I can remember.” She propped her head on her hand and tried to focus on her friend. “So you weren’t born in Somerset, then?” Cath asked her. “No, the church and the reception place – they’re pretty,” Bonnie told her. “Yes, they are,” Mary agreed. The girls drained their latest drinks, grimaced and then put the test tubes back into the rack. Frowning at the nearby speaker from which loud music was playing, and wondering if it was a sign that she was getting old, Mary turned and looked all round the bar. Janine pointed to a location behind her. “Over there,” she told her. “What?” Mary asked, leaning closer. “Hang on,” Mary said, putting a hand on her arm. “Tell me after – I need the loo.” She stood up and wobbled a little as she turned to look for the door to the ladies’ toilets. The floor of this pub mustn’t be level, she mused to herself. “Mmm, on schedule,” Janine said. “Nothing – go!” Janine told her, and ignored Mary stumbling across the room in favour of looking at her mobile and adding another phone number to her contacts list, finishing the update with a fancy flourish. “How many times?” Cath asked Mary a couple of minutes later when she returned and slumped onto her stool. “Stop talking now,” Mary interrupted, giving her a wink to show that she wasn’t being rude. She lifted the test tube that Bonnie had refilled and knocked it back, pulling a face as she swallowed. It was probably because she was feeling a little unwell, but it wasn’t the first time tonight that her drink had tasted funny. “What’s going on?” Mary asked, squinting towards the entrance while she and the others moved back onto the pavement again. “John and Sherlock are in there,” Cath told her. They started to walk down the street in search of their next venue, but then Janine turned and looked back towards the door they had just left. Bonnie handed over one of the test tubes. “Cheers,” she said. Mary knocked it back in one. Mary was plastered. In the smoking area outside the pub – where they’d gone so that Cath could have a cigarette – she was loudly and drunkenly gesticulating and sounding off to a female customer over the very loud music. “I know ash!” Mary told the woman, then paused momentarily and frowned a little. Something about that sentence wasn’t quite right, but nevertheless she felt it very important to make her point. She repeatedly poked the woman’s upper chest with a finger to emphasise her statement. “Don’t – Tell – Me – I – Don’t!” she said pedantically, finishing the sentence by putting her hand on the woman’s shoulder and pushing her. The woman swung a punch at her face. Mary swayed back – definitely through skill and judgement and by no means at all simply by luck – and avoided it. Nearby, the other girls jumped to their feet as the woman stumbled forward and almost fell onto a nearby table. Janine grabbed Mary from behind and pulled her away while she flailed wildly towards the woman who was being helped up by one of her mates. “All right, all right, enough!” Janine told Mary, dragging her a few feet away while supporting most of her weight. She propped her onto her feet. “Stand up straight,” she told her sternly, then pointed her towards the exit. Mary turned and pointed a finger back towards the woman as she finally remembered what she had been trying to tell her. All was silent. Mary cracked one eye open and blearily peered through the bars in front of her without moving her head, eventually realising that she was lying on the stairs near the bottom of her own staircase. She was on her side looking through the bannisters, and a grunt from behind her made it clear that Janine was lying beside her. Carefully craning her head upwards, she could just about make out Cath and Bonnie sprawled side by side several steps above them. She closed her eyes again, but then realised that she had something else important to announce. “I have an international reputation,” she slurred. There was no immediate response from any of her friends. She opened her eyes a little and looked over her shoulder towards Janine. “Do you have an international reputation?” she asked fuzzily before settling her head down again and closing her eyes. “No, none of us has an international reputation,” Janine told her. “No,” Mary agreed. She paused for a moment, then turned her head towards Janine a little but didn’t open her eyes. “Ssss... Central Intelligence ... something or other,” she added. She settled her head back down on the stair and grunted quietly. Mary and Janine sat up, trying to stand but too tightly wedged together. Mary fell off the step and thumped on her backside onto the next step down. Blinking and trying to clear her blurry vision, she reached up and took hold of the post at the bottom of the bannisters before hauling herself to her feet. She stumbled along the hall, then fumbled at the door a couple of times before finally managing to open it. Her next door neighbour Kate Whitney was standing outside and what the hell was she holding in her hands? Despite her wooziness, Mary’s training instantly kicked in and she was already tensing her muscles ready to attack and disarm her when Kate relaxed and lowered the cricket bat she was holding in both hands. Mary stared blankly at her. Mary slumped against the wall and beamed at her. Kate looked at her wristwatch, then raised her eyes to Mary’s bloodshot gaze. “You’ll never believe how short a time you’ve been out,” she told her. Yeah. Okay. As you were. Nearly three years ago I rewrote a story which I had originally done for another fandom, adjusting it so that it applied to Sherlock and John instead of two characters from the TV show Primeval. At the time I mused in my Author’s Note about whether I could sue myself for plagiarism, but one of the commentators reckoned that I was demonstrating the ultimate in recycling. This time I should probably be given an award for such prodigious recycling. But anyway, for anyone worrying about alcohol poisoning, I didn’t envisage the girls having vodka shots with every test tube of fruit juice, or they’d have been unconscious by the fourth bar. I saw them only having a couple of shots in each bar and drinking the juice on its own for the rest of the time. They might even have only bought two bottles of juice at some of the bars and shared them. I wasn’t suggesting for a moment that the girls were all rampant alcoholics. Drink responsibly, kids. Oh, and if there’s anyone out there who hasn’t been following news about the series after the season 3 broadcast, the ‘near-miss’ in between bar #6 and bar #7 – and specifically Janine’s realisation that it’s a gay bar – is because the producers and cast later revealed that there’s a deleted scene from the stag night in which John and Sherlock suddenly realised that they were in a gay bar. And before you tell me, yes I know that in England you can’t just go to a church a couple of hundred miles from where you live and ask if they’ll marry you. If I understand correctly, you have to live in the neighbourhood for a while and spend time attending services at the church – at least, you do at the more traditional churches – before the vicar will even consider letting you marry there. Or, at the very least, you have to have personal connections to the area, for instance maybe you grew up there or your parents still live there. Just which of John or Mary has connections to Somerset was never made clear or maybe Steve Thompson didn’t bother doing his research, which is not like him at all (insert Sherlockian eye roll here). But Sutton Mallet (the town which appears on the wedding invitations) is a real town in Somerset, in the south west of England. It’s about 150 miles from London and, on a good day, would take over 2½ hours to drive to. On a Saturday in mid-May, even though tourist season hasn’t really started yet, you’d be mad not to allow at least 3½ hours to get there by road. Quite what Sherlock and Mrs Hudson are doing at Baker Street on the morning of the wedding is beyond me. Even if they go by train it’ll take nearly 3 hours from Paddington to Bridgwater, which is the nearest mainline station, and then they’ll have to get a minicab to the wedding venue. To be on the safe side, they would need to be on the road, or in a taxi to Paddington, at about 7.30 that morning, and it would take only one traffic accident blocking the motorway or the A303 – or a signal failure on the railway line – and the best man and John’s surrogate mum are not going to make it in time. Why the hell didn’t they go down the night before and stay in the hotel where presumably the majority of the guests are going to stay after the reception? For that matter, just where was Sherlock heading when he left the reception? Was he really going to go to Bridgwater to get a train back to London ... without even taking his violin with him?? And having done a whole heap of googling to check and double-check all of that, I need to stop being such a nerrrrrrrd! I think the fact that Sherlock buggered off without his violin says a whole lot about the state of his mind and emotions. *nods sagely* You know he'd just text Lestrade and make him schlep it back to London AND drop it off personally the next day. That said, I can't see Sherlock wanting to stay in the hotel with PEOPLE, and particularly not with lovely-dovey wedding guests, and definitely not under the same roof where John and Mary will be sharing a bed and possibly performing heterosexual coitus. This was a really fun fic. I got chills when Mary got 'assassins' wrong. It's like the broken Daleks calling out "Eggs! Eggs! ...Exterminate!" LOL Scary, she is. Yay for the nod to the gay bar. Also, kudos for fleshing out Mary's friends. Janine was a hoot, and Cath and Bonnie were fun. If the writers hadn't meant the wedding to be in Somerset, then they shouldn't have used the name of a town in Somerset! I mean, it would have been easy enough to make up a name. The wedding invitations clearly said "Sutton Mallet," so that's where the wedding must have been! It baffles my brain what Thompson (or whoever made the decision) was thinking by using the name of a real town so far away from London. *sighs* Sadly I can never take the MST advice once something as stupid as this comes up in an episode! Yes, way to go, John: not only compel your shy, antisocial friend to make a speech in front of PEOPLE, but hold the wedding so far away from London that he can't escape easily. Man, you are really punishing him for the past two years. Anyway ... *takes deep cleansing breath* ... I'm glad you liked the story and the new characters. And Oh My God, Mary as a Dalek. Now that is a scary thought! Ooo, I'd missed the pointedness of naming the town. Here, allow me a justification to soothe your brain, because I get the same itch from random annoyances: this 'verse isn't our world, so maybe in their world, Sutton Mallet is much closer to London. Baker Street is on Gower Street. Sumatra Road Station isn't a thing. Whew! I feel better. Maybe, after so many months of helping and planning, the reality of John's wedding crashed down on Sherlock and he ditched convention. He was really working hard on the 'what big day?' line of denial. I'll blame all the annoying things on Thompson, and the artistic license needed to make good TV. When I watch Elementary, I get annoyed a little because they've shrunk New York down time-wise. It's always 'I'll be there in a half-hour.' Yeah, no you won't because you are about to take a ten mile trip through Brooklyn to the barrier island on the ocean, and unless it's 2 AM there will be traffic like a mother and you aren't getting there before dark. Also, they've set Sherlock's gorgeous brownstone in Brooklyn Heights which is hardly the equivalent of central London or midtown Manhattan, and they film in Long Island City which is in Queens, so the view never matches up with the setting. That actually makes it easier for me, that they aren't even pretending this is the same world as ours. I try (well, I say try) to do the same with Sherlock or I will obsess and ruin the fun. "Method Act" by Splix is almost therapy in that regard, lol. Mary as a Dalek! LOL Well, we know she can easily negotiate a flight of stairs, so if she is, she's a new breed. *You know what? It occurs to me that this is another one of the many things that doesn't make complete sense until you look at the subtext! In any wedding morning scene, who has their special clothes hung up from the day before, displayed like that as a visual reminder of the day? The bride! This is another case of poor Sherlock putting himself in the place of the bride. And who arrives to the church separately from the groom? The bride. 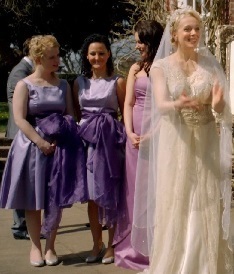 At every point of the wedding day, Sherlock shadows the bride's actions. He even tosses his 'bouquet' to Janine, the Maid of Honor. I bet that's what all this atypical nonsense is about. That, and Sherlock is already very upset about the wedding. I did soothe myself with the realisation that we didn't see Sherlock put the suit on in his bedroom - he just took it off the wardrobe door and so he might have been about to put it into a dress bag before leaving for Very Far Away. But you're right about the flower - all the flowers should have been delivered to the church as late as possible before the ceremony started so that they were still fresh. I always blame annoying things on Thompson! And it's usually for a very good reason. As for your asterisked final paragraph, I have my fingers firmly in my ears, my eyes tightly closed and I am singing very loudly indeed so that I don't even have to think about it. Thank you! Glad it made you giggle. Nearly three years ago I rewrote a story which I had originally done for another fandom, adjusting it so that it applied to Sherlock and John instead of two characters from the TV show Primeval. I absolutely don't know what you're talking about and you totally haven't made me re-read this fic. I definitely didn't enjoy it or recommend it to your other readers. I need to stop being such a nerrrrrrrd! No way. Please keep on being such a nerd! Please keep on being such a nerd! Unfortunately, I couldn't stop even if I tried! I will always nitpick the hell out of everything. Oh, Choco, of course I'll be your beta reader when you write the gay bar scene. Hee hee - what a great send up!! "...and it would take only one traffic accident blocking the motorway or the A303, or a signal failure on the railway line and the best man and John’s surrogate mum are not going to make it in time." Yes, it crossed my mind to wonder why they were calmly drinking tea in 221B when there was a long journey ahead - and why Sherlock dressed in his morning suit with such a long journey ahead . . . Ah well, artistic licence I guess! (Ooooh, just like you!!! *grin*). I'm hoping that Sherlock was only taking the suit off the wardrobe door to put into a dress bag, otherwise he'd have turned up at the wedding looking completely crumpled and someone would have had to make him take the suit off so it could be ironed and could it be me who helps him out of his clothes, please? Now I'm all worried about the violin. Lestrade? I'm thinking maybe Molly alerted Mrs. Hudson and they loaded it into Mr. Chatterjee's car when they all went home. Tom volunteered to take it but Molly wouldn't let him touch the thing. *giggles* The ash-ash-ins bit was the first line to inspire this story! I shouldn't have said anything about the violin - now I've got everyone fretting about it!